Updated colors, materials, and streamlined operation. That is the name of the game for Ultimate Direction’s new race pack. Building on the success of the Skimo 18, the Race Vest has been optimized for speed, speed, and more speed. 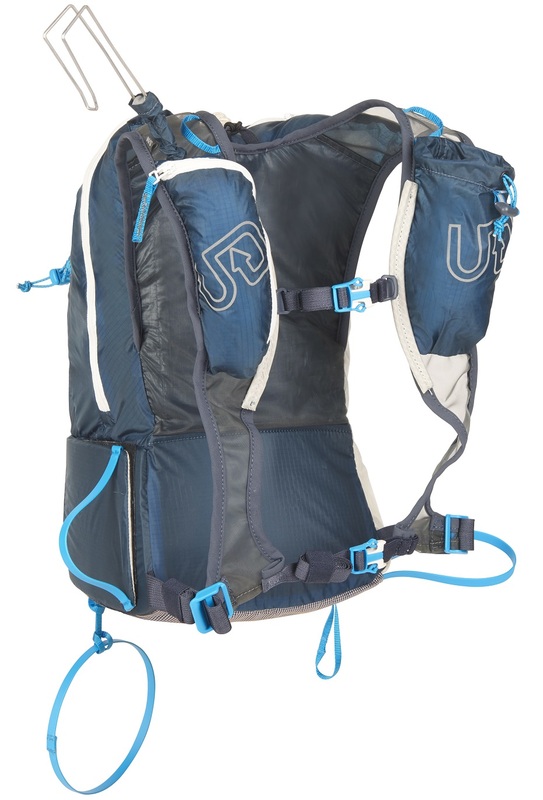 With less front pockets than a typical vest, the Race Vest enjoys freedom of movement and breathability without sacrificing easily accessible hydration and calories. 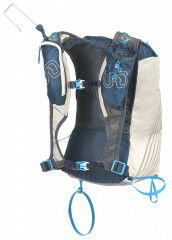 Breathable mesh shoulder straps and back panels help you vent while still retaining durability and rip-stop qualities. 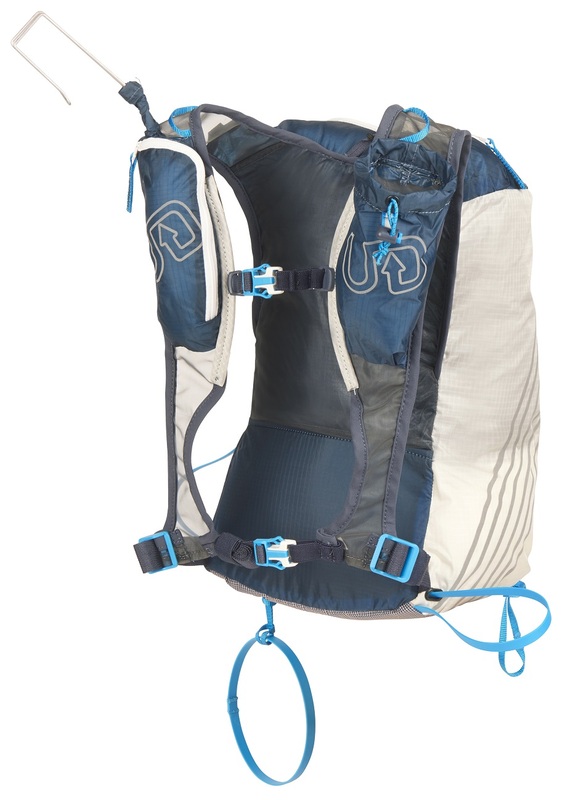 Speaking of rip-stop, anything that’s not breathable mesh on this pack is rip-stop nylon, so you can rest knowing your gear is safely secured and won’t fall out after snagging a tree. 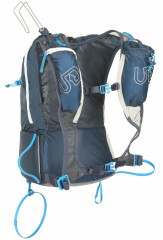 Adjustable rib-straps help fine-tune the fit of the Race Vest to eliminate bouncing and increase security on a demanding line or transition. 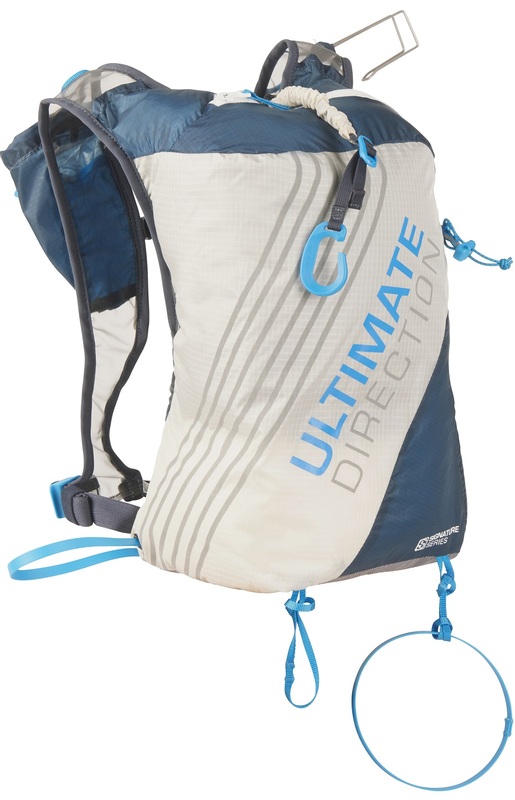 If you are looking for a light ‘n fast pack that is equally at home inside or outside of the tape, the Ultimate Direction Race Vest is the golden ticket. Interchangeable ice-axe and ski-carry loops are independently adjustable and let you further customize the vest to your liking. Sternum-strap is height adjustable to get out of the way for racing, or ride lower down for extra security in the backcountry. Both the ski-carry hook and wrap-around ski-carry are included, removable, and easily adjustable for different skis/missions. Velcro crampon pouch has a shaped and reinforced handle to allow for easy access to the ‘pons. Zippered front pocket can hold a camera, phone, keys, or gels. What shovels will fit in this pack. I’m most likely a m/l. Hey Todd! Most any shovel with a collapsible handle will fit in this pack as long as the blade is somewhat compact. I use a Mammut Alugator Light in this pack and there's a pretty decent amount of extra space for a snow study kit, first aid, puffy, extra food, etc. I see that you guys have the weight listed at 334 grams, whereas on the Ultimate Direction site it is listed at 534 grams. Wondering which it is? Thanks. Hi Danny, if you see "yes" in the "specs verified" column in our listing you can be assured we have weighed it on our calibrated scale here in the Skimo Co bat cave. Our scales have verified this pack at 334g. I'm guessing that's a typo on the UD site.